The Smartforms and Feedback app is a dynamic smartform designer and management tool used to create documentation and guidelines for service execution. It provides a robust, flexible design interface in which designers can assemble smartforms to suit any scenario, and an intuitive library management interface with which to manage templates. Smartforms provide a script for service execution. With the Smartforms and Feedback app, you can ensure that your employees have the right script for the right scenario. The Smartforms and Feedback app is built for efficiency. You can copy templates to make adjustments for a new scenario, re-utilize elements created in other smartforms in new smartforms, and quickly change status of smartforms so that you and your employees are using the most up-to-date smartforms available. As the template resource base continues to grow, it will become more important to have the tools necessary to manage them. This is where the template management interface becomes so useful. With it, users can quickly search and filter templates, select templates for editing, make copies of existing templates, and even import templates from another source. Best of all, the app supports tabbing, so users can quickly toggle between templates. Template Name The Name of the template. Version If applicable, the version of the template. This number will update automatically when the template is cloned or when exporting for translation. Language The original language of the template. Labels The label/s associated with the template. 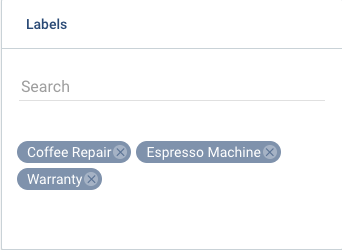 For information on creating/adding labels, refer to the template Labels section below. Status The current state of the template. Options include: Editing; Translation; Released; Archived. For more information on template statuses, refer to the Smartform Statuses section below. Creator The account ID of the template creator. Created The date on which the template was created. Key template information can be created or edited directly from the templates screen. These fields form some of the columns used to filter and manage smartform tempaltes in the smartforms List screen. Language The original/default language of the template. Revision If applicable, the name of the template revision. Here, you can enter information about the current revision. Labels Any labels associated with the template. Labels can be used to filter like templates. Template filters can be applied to sort and filter templates. Language The language of the template. This filter can be applied for translated and default/master templates. State The current state of the template. Options include: editing; translation; released; archived. For more information on smartform statuses, refer to the Smartform Statuses section below. Creator The creator of the template. This filter could be applied if there are more than one user creating and managing templates for your company. Label One or more labels associated wivth the template/s. Labels are added when creating templates or editing template details. Subchapter Subchapters become very useful for complex or lengthy scenarios. Label Can be used to organize and define sections. Table A powerful table element. Users can include any element type to align with business requirements and customer needs. Drop-down menu Create and define a drop-down menu. Number Input A field for numerical entries. Attachment To add attachments such as images and other files. Attachment Picker A more powerful attachment element. Calculation Allows users to run a pre-defined calculation. Checkbox Keeps the smartforms moving from start to finish. Picker a scenario-based drop-down menu. Series like a template within a template. The Series element allows users to combine all elements together to guide specific scenarios or actions that may occur. Status A user-defined status field. This can be very useful for follow-up activities. Signature An essential component of every smartform. Note: For more information on smartform elements, please refer to the following topic. The Smartforms and Feedback app incldues four configurations to change the information displayed in the Smartform Designer interface. Show Element IDs By selecting this configuration, the application will display the element ID (example: unique_chapter_1). Enable Save on Demand This setting disables the default "auto-save" settings. When this setting is enabled, you will need to manually click save to save changes to templates. This can improve performance for larger templates. 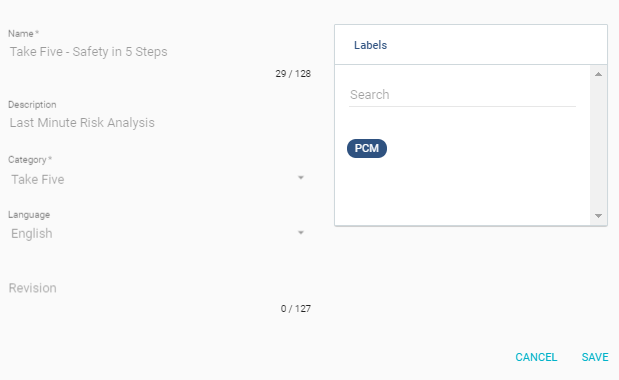 Enable Report View Feature This feature enables you to view and design template reports by selecting smartform elements and laying them over available fields. Mobile users would then be able to enter/complete smartforms using the same PDF Report View, making for an intutive smartform experience. Always increment clipboard element IDs with default naming When it is selected the numerical ID of an element in increased when dragging the element from the clipboard to the template, e.g. if there is a number element on the clipboard with id "numberinput3" the id on the smartform will be automatically changed to "numberinput4". 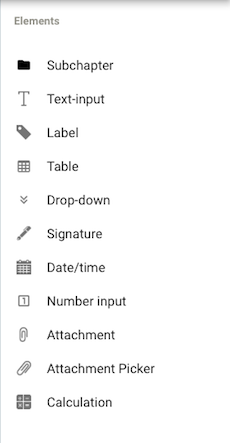 Additionally, this helps you when you have a specific element stored in the clipboard that you want to use in different templates and want to make sure the ID remains uniqure. In order to create or make changes to a new or existing template, it must be in Editing status. When you wish to make changes to a template, select the editing status from the status pane above. 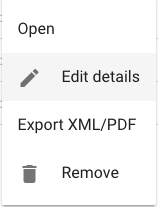 Smartforms can be exported in XML format in order to be translated. templates that are being translated will have a Translation status. Templates with Releasd status can be assigned to an activity in Planning & Dispatching app and used in the mobile app. Smartform templates that are no longer in use can be changed to Archived status. Templates with archived status can then be changed back to editing or released if desired..
Category The Category associated with the smartform. Name The name of the smartform. Revision Any time changes are made to a smartform, the application will automatically assign a new revision number to the template. Version The current version of the smartform. Any time a template is copied, the application will automatically asign the copied template a new version. 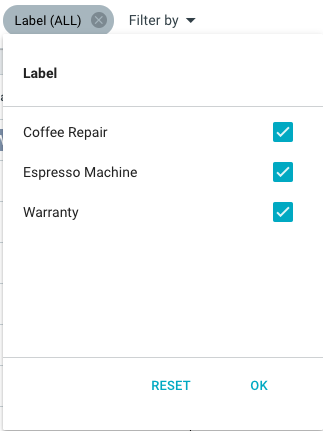 When creating or editing a smartform, you can select or create labels with which to associate the template.